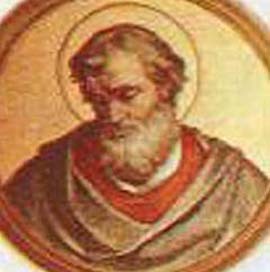 St. Anicetus succeeded St. Pius, and sat about eight years, from 165 to 173. If he did not shed his blood for the Faith, he at least purchased the title of martyr by great sufferings and dangers. He received a visit from St. Polycarp, and tolerated the custom of the Asiatics in celebrating Easter on the 14th day of the first moon after the vernal equinox, with the Jews. His vigilance protected his flock from the wiles of the heretics Valentine and Marcion, who sought to corrupt the faith in the capital of the world. The first thirty-six bishops at Rome, down to Liberius, and, this one excepted, all the popes to Symmachus, the fifty-second, in 498, are honored among the Saints; and out of two hundred and forty-eight popes, from St. Peter to Clement XIII. seventy-eight are named in the Roman Martyrology. In the primitive ages, the spirit of fervor and perfect sanctity, which is nowadays so rarely to be found, was conspicuous in most of the faithful, and especially in their pastors. The whole tenor of their lives breathed it in such a manner as to render them the miracles of the world, angels on earth, living copies of their divine Redeemer, the odor of whose virtues and holy law and religion they spread on every side.